Once you get your funnel up and you're getting traffic, there are some big questions to ask yourself. How do I know when my funnel or ads are working? 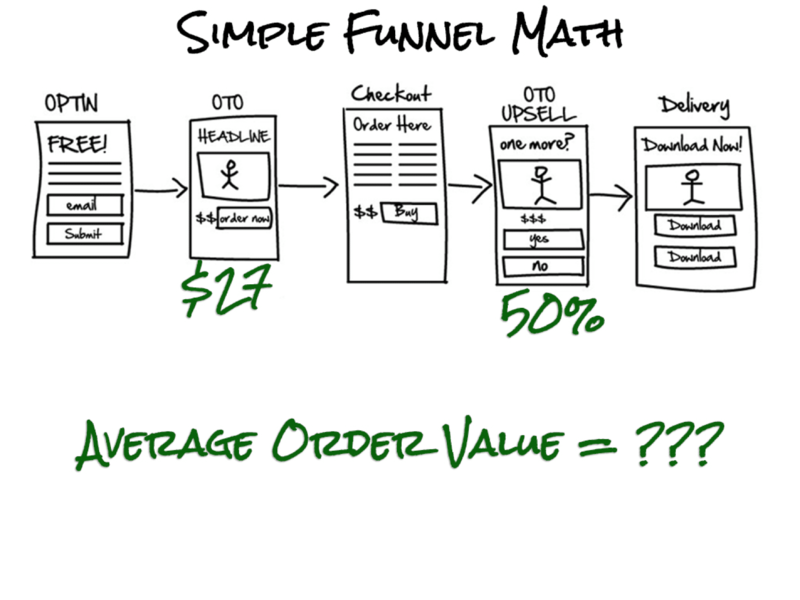 This is where funnel KPI’s comes in. There are key performance indicators and these can vary depending on your funnel, traffic, and exactly what your marketing goals are. My main goal with pay per click Facebook ads is to reach what I call a break-even point on the front end. I want to advertise for opt-ins., and then after the opt-ins, potential customers see an offer or a series of offers. I want that process to be break-even. Every dollar I spend, I get that dollar back. I don't really care if I'm profitable. I just want to break even. My customers have a significant lifetime value (Yes you can increase the value of your customers). Once they're on my customer list, I know the odds of them purchasing more go up significantly in the coming weeks and months. If I can create a break-even upfront funnel I can essentially buy all the traffic I want. Every dollar I spend, every day, goes right back into my pocket. That same day I'm net out-of-pocket zero and I'm growing my customer and prospect lists. The best things in life are free. If you have a break-even funnel, you're getting customers and leads for free. 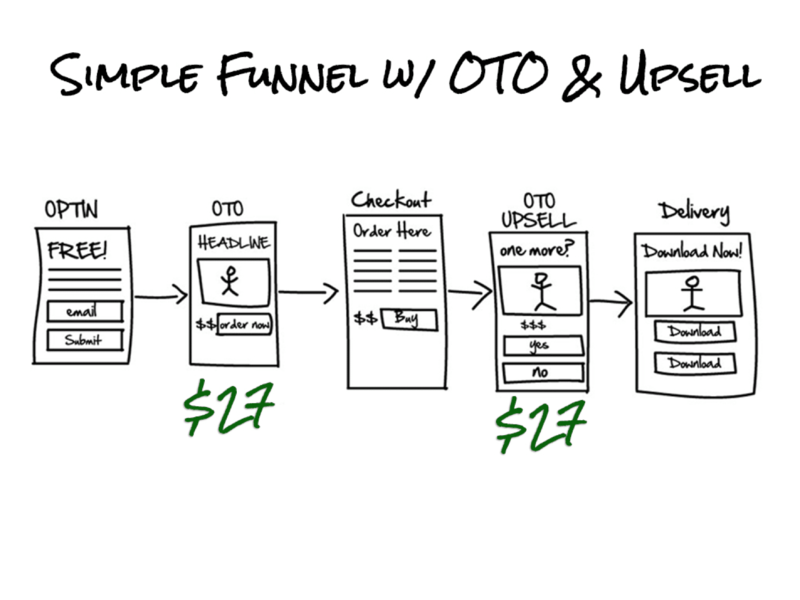 A few days ago, I set up a new opt-in funnel. It's really simple. After potential customers opt-in for a free item they get a product offer. The retail price on the product is $97. I’m offering it to them for $27. If they’re interested, they check-out. That transaction remains open and they get a one-time offer for another course. This one is a $77 course for another $27. Customers either click yes or no and depending on that, they pick up what they purchased. 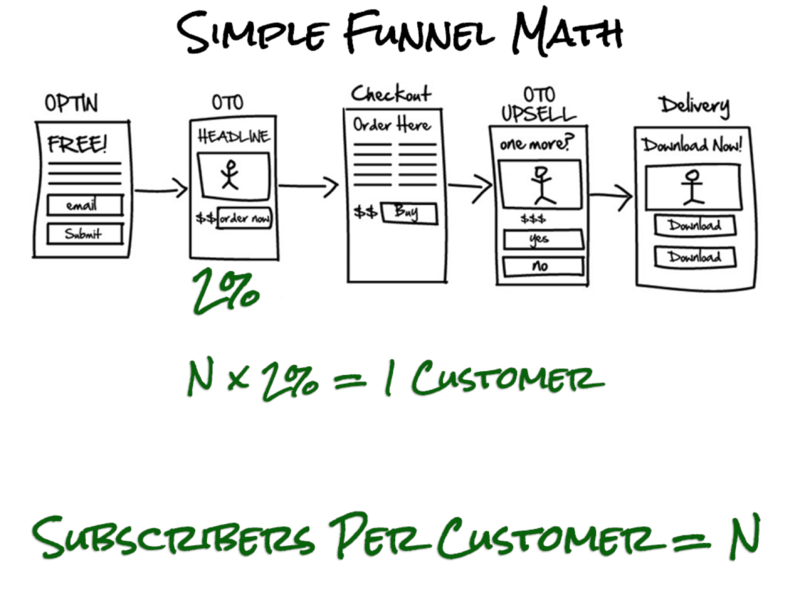 How Is the Funnel Working? To find out, we need to calculate. 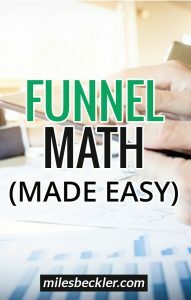 What I've noticed in running this funnel (with well over 1000 people coming through) is that I'm getting a 50 percent conversion rate on my second offer. They're both $27, so what I'm looking for first is my average order value. Keep in mind that this is just for this funnel and I'm only talking about this front-end order. If I've got a $27 one-time offer and 50 percent of these people are purchasing another one, what is the average order value? And here's how you calculate it. I'm going to make $40.50 every time someone checks out. Because every other person is going to take me up on this, it’s a bump in $13.15 per average order. Now that I know my average order value, I move on to the next step. My first one-time offer is converting at two percent which means that two percent of the people who opt-in and see my OTO are purchasing. I want to figure out how many subscribers I need to get one customer. 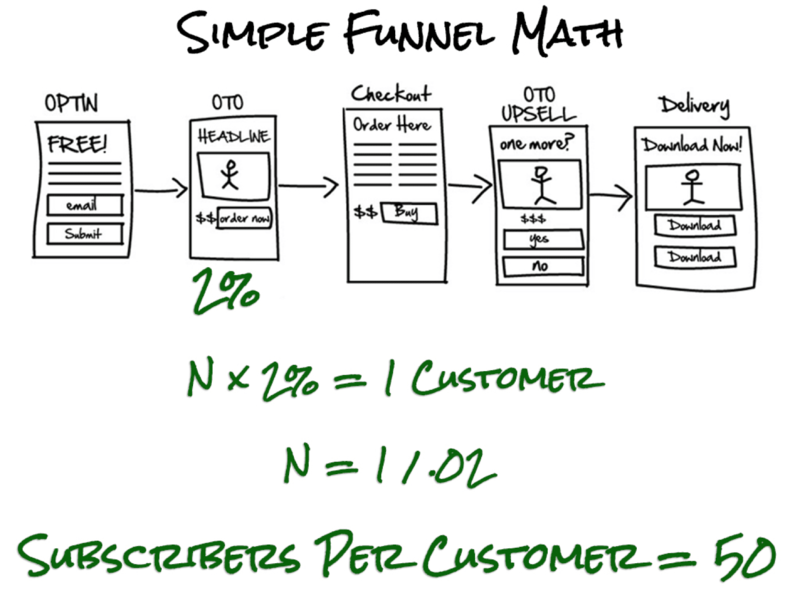 Divide the number of customers (one) by my conversion rate. In this case, it's 50. Now that I have this piece of information, I can go to the next level. This is where we actually get to put the numbers together. Every time I get 50 opt-ins, on average I'm seeing one person purchase. That's my two percent conversion rate and it’s worth an average of $40.50. 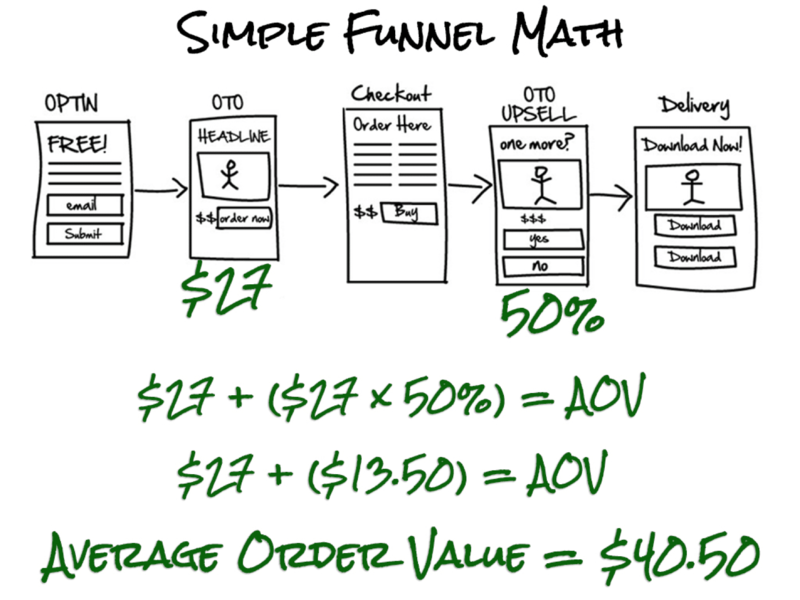 Take the average order value ($40.50) and divide it by the number of subscribers required to get one order (50). In this example, I get .81 cents. That's my break-even point. If I'm getting subscribers for .81 cents each or less, I'm good. That means I can put in $100 a day and get $100 out. I can put in a thousand dollars a day and get a thousand dollars out. The by-product is a massive number of subscribers and customers. 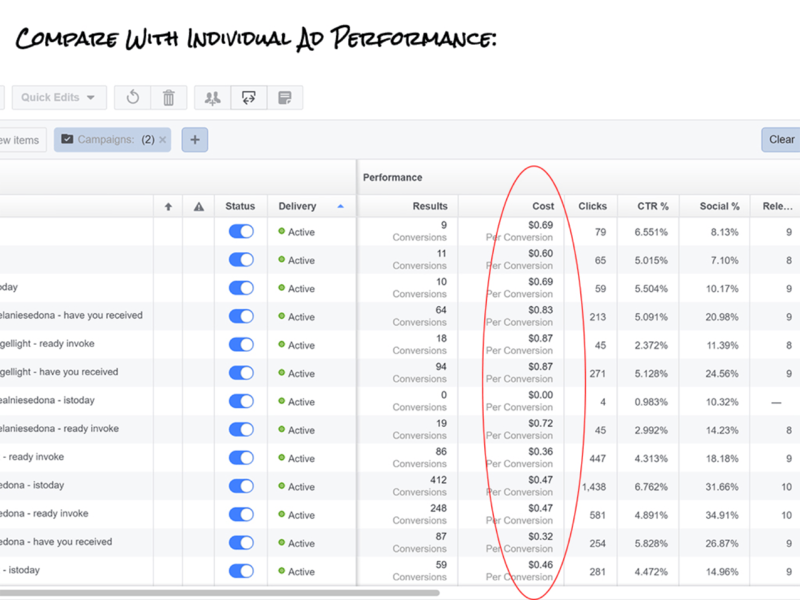 Within your Facebook Ads campaign interface, you’ll be able to see your cost per conversion. This is your cost per email subscriber. I started running a visitor's opt-in to retarget my audience. I've had over a thousand subscribers come in and it's cost me 43 cents per subscriber. Well within my KPI’s. On another campaign, you can see I've got 200 coming through and it's .87 cents per conversion which means I'm losing six cents per subscriber right now. And so that's mirrored here in the ad set level. 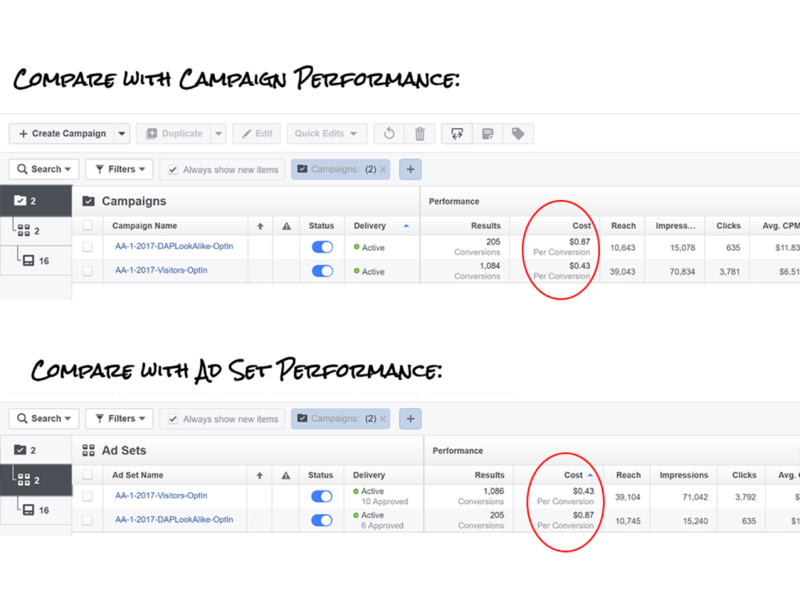 If you had three or four ads sets per campaign you would see more of them here and you'd be able to look at which ad set is giving you your KPI. The circled column is my cost per conversion. I can look at it line by line, ad by ad. You can see I have one ad that is .69 cents for conversion. That's good. What's really cool is this one that has 412 conversions. That's 412 subscribers at an average of .47 cents each. There’s also an ad with 248 subscribers at an average of .47 cents each and another at .32 cents per subscriber. That's absolutely a brilliant number. I want to point out my relevant score. They are very high – eights, nines, and tens. This is why I'm getting a good result. Facebook sees my ad as being highly relevant to my audience and they see my ad as being highly relevant to the content I'm sending them to. I get a good relevant score which means I get a nice low-cost click cost and cost per conversion. If you feel like you didn't get all of the math or you want help with it, watch the video below. Take notes! Knowing your math and your numbers is what ultimately will set you free. That is how you win - with statistical probability. The campaigns in my example are still new. I'm monitoring these numbers very closely as I get to that ten thousand subscriber mark. If I see ten thousand subscribers coming in at an average of .40 or .50 cents per subscriber, and my break-even point is .81 cents per subscriber, I know that I'm net profitable on the front end. Plus everything I make down on the back end of my funnel! And as you know, if you’ve been watching me for a while, the back end of the funnel is where you make your money. Pros focus on the back end of the funnel, rookies focus on the front end. I’ve got to focus on the front end here because I'm turning on the lead machine. I'm bringing in a thousand leads a day from Facebook pay per click ads and I'm going to ride this as long as my KPI’s stay within my operating range. I'm running split tests on my advertisements already to keep refining the wording. What are those phrases that get my target market to take action? And also, what are the other target markets that I can go after through lookalike audiences and the interests. This way, I can actually expand my audience and can keep marketing at this aggressive pace for a long period of time. This is the game. Broken out in numbers and super simple. I have some questions. 1. To actually collect payment, do I need something like Sam Cart? 2. Or is there a payment collection system within Thrive Themes? 3. 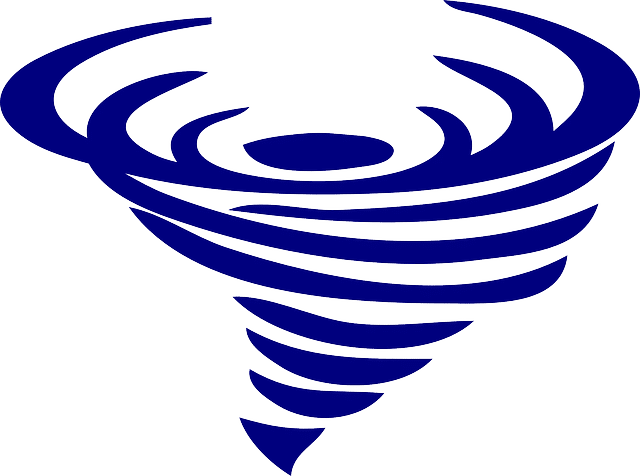 Do I need a dedicated email system? Doesn't Thrive Themes have an email system built in? Thanks! 1 - Yes you need a cart. ThriveCart is a great option, but I think they are closed right now because they are doing a big update... 2- no payment collection in Thrive Themes... 3- Yes you need an email management system... They handle the 'whitelisting and deliverability' of your mail meaning they keep a good relationship with all the email companies... I am using Aweber and Active Campaign. Both work, I'm liking Active Campaign more and more. Hi Miles, Great info, Thank you. Can I do a funnel like this with OTO Upsells etc with Thrive Themes? Hey Miles, Let me start by thanking you for the content you produce! My niche is B2C companies. I run FB ads promoting local businesses promotions. People who click on my ads go to a optin page where we provide a free workout if they schedule on the page. Once they go to the gym, the owner closes them. How do I calculate KPI's for this? The membership is $120/mo. LTV is estimated to be $720. (6 month average membership). 80% of people who show up become a sale. 50% of our leads actually show up. 20% conversion rate. Working with a monthly ad budget of $400......so confused! One important question is how you are tracking the in-person sales and show up rate from the ads vs. walk-ups. Is this a completely unique 'offer' or coupon code from the PPC ads so the sales people can 'track' where the visitor came from? That is important or your walk-in traffic will skew your PPC numbers. So your marketing budget of $400 would need 4 new members to be cashflow positive month1. And you'd be minted by month 6 with your LTV, but let's keep that as icing on the cake and only focus on your front end Month1 number. So... 4 new customers and you convert 80% in person. This means you need 5 to show up. Only 50% of leads in show up... So you need 10 leads. 10 leads from a budget of $400.... You can spend $40/lead and be golden. Hornung would want you to be more profitable (he is my teacher) so he'd say $20/lead is your goal. That would make you extra profit month 1 and you could increase your budget to $800 in month 2 and so on... Parlay the profits back into ads! Ok, so 20% conversion from traffic to lead... 1 in 5 convert. Therefore to get 10 you need 50. $.40 per click is your $20 CPL number.... $.80 per click is your $40 CPL number (CPL is cost per lead). Should be WAY do-able for you... Ad copy, targeting, and tracking are key... But those numbers make me think your biggest problem will be hiring new sales people and trainers because you should be able to hit those KPI's all day long if you are in a medium to large size city. Honestly mate... I highly recommend you check out Hornung's Facebok course... The way he breaks down the math, the targeting, the ad copy... Plus all the people in the group who are in this space who share because they are all over the world and aren't "competing" with eachother is worth it. It is a $1500 investment, but honestly I spent like $6,000+ failing forward to figure it all out on my own and his methods are crushing it right now. Full disclosure, I am an affiliate... But I only mention this because I truly believe that if your numbers are even remotely close you could scale your business in a major way over the next year with his methods and help... Especially with 'bikini season' descending upon us... Feel like you have a window of opportunity to reap rewards this year. Either way, no worries... Hope that breakdown of the numbers helps! Hi Miles. I'm interesting in Hornung course, but your link is sending me to someone else course. Did you change your URLs destinations? Where can I find Hornung course?